The conversion rate optimization (CRO) crowd is adept at tapping into these to drive the actions of their audiences. 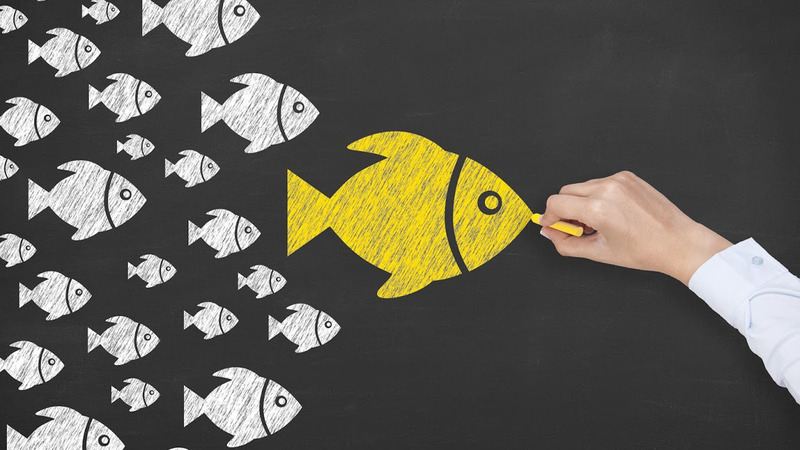 When it comes to ad copy, there may not appear to be a lot we can do to actively influence our search audience. Short of a screaming headline (not allowed), all we have is a limited set of characters. We can make every one of those characters truly work by channeling our inner CRO expert. Before we jump into the words that work, let’s take a few minutes to understand the psychology of decision-making. What causes us to choose X instead of Y? What’s behind our decision to opt for free shipping rather than 10 percent off our order? Fact is, we can influence our audience with smart, effective ad copy. Here’s how. Okay, okay. I know the whole reptilian brain thing was huge back in 2012. But it’s still a really smart tactic at its core and can do magical things for ad copy. the reptilian brain, which rules basic survival functions like hunger and fight-or-flight. Is anyone else appalled to learn that our decision-making is most often seated in our reptilian brain?! We may think we’re being logical and process-oriented, but that’s just a story we tell ourselves — because our true instincts come from a gut-sense we aren’t even aware of. When it comes to decision-making, we are more lizard than human. Our reptilian brain is driven by five areas of awareness: Pain, emotion, fear, ego and contrast. These five areas of awareness hold the key to influencing your audience with ad copy that sparks action, so let’s explore how. So much of our drive to purchase comes from pain points, whether large or small. We might want a new car because it pains us to continue to pay for repairs on the old one. We pick a quiet restaurant over a noisy one because of the agony of not being able to have a conversation over the din. Pain is a primary driver. Our ad copy can draw attention to it and offer a resolution with our product or service. For example, most of us have had to clean up a trash-related mess in our homes at some point — usually when we’re the most tired or running late or wearing the nicest clothes. It’s never fun and never at a good time. Here, avoiding messy trash disasters is a huge selling point and certainly offers a solution to garbage bag pain. Think about the pain points of your customers. Now, consider how your product or service solves those paint points. Work this copy into your headline or description (and certainly on your landing page). Touching your customer’s emotional strings creates a connection; it breaks down resistance and lets your customer open his or her mind to your product. Who can get through a Dove soap commercial without getting misty-eyed? Or the Budweiser Clydesdale commercials during the Super Bowl? It’s important to note that we remember the brand names behind these highly emotional ads. Hallmark cards, anyone? I’m teary just thinking about them. This doesn’t always have to be done at such a grand scale. Simply planting an emotional thought or speaking to the aspirations of the searcher can often be enough. Williams-Sonoma evokes a wonderful sense of emotion with ad copy about cooking for friends and sharing a meal. This copy brings up your own memories of doing this, and suddenly those warm fuzzy feelings are part of your experience with Williams-Sonoma. What moves your customer? What is it about your product that creates a connection with others? Note that the emotion doesn’t have to be teary drama — it can be a range of emotions, including anger and humor. Once you land on an emotion you want to trigger, make sure ad copy, description and landing page are all in sync for a complete and authentic experience. Famous brands use fear all the time in their taglines. Nike’s “Just Do It” takes aim at consumers missing out (channeling FOMO if you will), and L’Oréal’s tagline, “Because I’m Worth It,” confronts a woman’s fear of her own lack of value. Ad copy can get to the fear in the customer in the same way. Just the thought of something minor like dry eyes affecting my vision would be enough for me to click to learn more or pick up the phone to set up an appointment with my ophthalmologist. Fear is primal and acute, and if your ad copy can mine that vein in a way that’s not exploitative, you can drive sales. Get inside your customer’s head and figure out what they’re afraid of, and how your product can remove the fear. For example, “Never shiver again” for a winter coat. Often, the connection isn’t obvious. Plastic bowls, for example, answer the fear of breaking china. A new camera answers the fear of forgetting important moments. We are essentially all ego-driven. “What’s in it for me?” isn’t just a marketing pillar, it’s a truth about you and me in every waking hour. So it only makes sense that ad copy that drives right to the heart of the ego is going to have some success. This Bobbi Brown ad really hits hard with “Perfect Your Eye Look!” and “Get a Lit-From-Within Glow” and “Be The First to Shop It.” This is all about me, and as a result it resonates extremely well. The easiest way to zing your audience’s ego is to ask yourself, “How would I want to be talked to?” If you’re being honest, then compliments, praise and encouragement will top the list of ego-happy ad copy tactics. There’s a reason weight-loss businesses’ entire advertising strategy can be summed up in the phrase, “before and after pictures.” We love to see contrast. It’s the most apparent way to recognize difference. There are a number of ways to use the contrast technique: between yourself and a competitor, between yourself and the absence of your product, or between yourself and the current solution (which may not be a product). For example, Belt A is made of finer leather than Belt B, or using Belt A is better than hitching your pants up all the time or Belt A is more fashionable than suspenders. Alternatively, you can also look at known pain points of your competition and highlight how you’re different and/or better. For example, to become a member of a warehouse club, you’ll need to pay an annual fee. For some, this may be a pain point. Sometimes what you DON’T have is a more favorable appeal, in a contrast situation. No fees! No batteries! No sticky residue! In a specific situation, all of these contrast points would be a stronger selling point. First, take a look at your closest competitors. What are you doing or offering that’s better? Then look at your product in contrast with alternatives that people may use or buy. What’s better about your product in that context? Finally, look at your product in contrast with no product — this can be an effective contrast, as it creates needs. I had no idea I needed non-slip sticky inserts for my heels until an ad told me I didn’t have to have aching feet. Here are two great ways to do this. One word — a single verb — can make all the difference in the world. A fascinating study illustrates this. 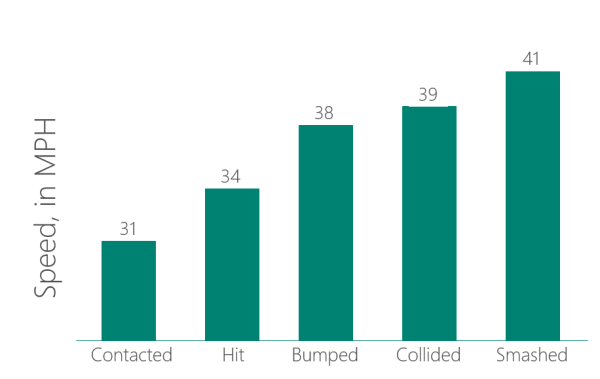 The livelier verbs like smashed and collided were the ones that lead to perceptions of higher speeds. Another interesting effect. Participants were asked one week later whether they had seen broken glass at the accident site. The correct answer was “No,” but 32 percent of the participants who were given the “smashed” verb said there was broken glass. Even our memories can be influenced by word choice! Instead of going with typical word choices such as “Buy these boots” or a purely descriptive ad title such as “Black boots at Storename,” test some lively verbs that inspire action. How do you think “Rock these black boots at Storename” or “Walk all over in these black boots at Storename” or “Strut your stuff” would perform in comparison? Go with something that conjures up a more vivid mental picture to help you leave a lasting impression. The framing effect is a cognitive bias; people react differently to a choice depending on how it’s presented or framed. For example, the media can choose to portray an event in terms of lives lost vs. lives saved to leave a different impression of the same event. Or a grocery store can choose to label their ground beef as either 99 percent fat-free or 1 percent fat, and it’s likely the store will see more sales for the former. The facts remain the same, just the degree of appeal or perception can change based on how it’s presented. The differences may seem miniscule, but the impact usually isn’t. The description isn’t the only place to test the framing effect, either — test it out in the headline, the call to action and the display URL, too. Influencing with ad copy is one of our strongest tools in the paid search game. It’s also the most fun, because you get to open up your creative brain and your lizard brain and really bring some joy and satisfaction to what is normally a very technical job. Remember to look for the big impact within the smallest places. Set up some tests using ad copy from each of these points and see how it goes. I’d love to hear about your results, too, so drop me a note at @purnavirji. Purna Virji is Senior Bing Ads Client Dev. & Training Specialist at Microsoft. For well over a decade, Purna has been living, breathing and dreaming PPC, SEO, analytics and content strategy. Her devotion to all things digital marketing has seen her regularly write for industry publications and speak at conferences across the globe such as SMX Advanced and MozCon. An award-winning former journalist, Purna was the CEO of Purview Marketing prior to joining the Bing Ads team. Say hello @purnavirji. Tags:Channel: SEMPaid Search ColumnSearch AdsSearch Ads: GeneralSearch MarketingSearch Marketing: General.